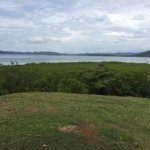 This 1733+ m lot is located near the “cut” between Isla Solarte and Isla Bastimentos. It is in a protected bay with deep sailboat water at the dock. It is only a 20-minute boat ride and quite a few fun loving ex-pats are sprinkled throughout the area. Red Frog Beach is only 10 minutes away, as is Crawl Cay. This land has good contours for building an island house or B&B. A dock is in place and this nice place is partly cleared for good views. Clean ROP land with title applied for. Check it out, as it is a great place to build your retirement or business dream in a popular area that is just going up in value due to available surrounding property. Contact us for a showing.